Learn more at the PulStar Annual 1-Day Seminar–Saturday, 4.21.18 in Pittsburgh. From marine zoologist to chiropractor, Dr. Greg Alexander, DC, has had a full and varied career. One day when he was at work at the Mote Marine Research Lab, he ruptured a lumbar disk, and after witnessing first-hand the effectiveness of chiropractic techniques on his own injury, he decided to become a chiropractor himself. He graduated from Western States Chiropractic College in 1987 and began practicing the next year in Spring, Texas. 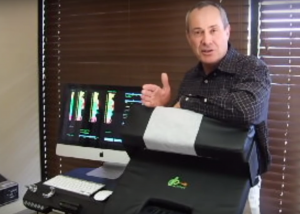 Dr. Alexander has been using the PulStar at his practice since 2011. He carefully constructed his testimonial over that time and asked that we share it here, with our friends and customers. Just a note to thank you for the generous repair of my Pulstar after the devastating flood here in Houston, from Harvey, where we took 5.5 ft. of water flowing through our 30-year location. Thanks to our Insurance agent, we were covered for ZERO. I will have to rebuild. That’s alright. The new clinic will be my legacy, and of course, we will use the PulStar. I have to say that it is surely refreshing to meet such a grounded, quality family as yours is. It is always a pleasure to call, and I always walk away from your phone conversations with a great big smile on my face. You have always taken such good care of me. I know you treat everyone as you do me, but people reading this need to know that I have noted that your word is your bond. Something that is important to me, as I was raised up in Iowa. I can always count on you guys being there, and being REAL FAST when solving any problems. I have had my PulStars (2) since September, 2011, and they have not had ANY problems. It has always been ME that had the problem, with my 63-year-old brain wrapping itself around routers, and settings, and power outages, etc. OR even batteries dying in a mouse. Your equipment seems so reliable. Everyone can relax and stop worrying about it. Clinically, I have made some significant observations using the PulStar on my patients. But first, some history as to my technique and outcomes. I am a 25 year + Advanced Proficiency Activator Methods Chiropractor. I am very disciplined in my approach to utilizing this technique, and I “follow the book” to the highest standard, getting great results (approaching stellar). I also like to learn as much about the technique as I am able, to the point where I guess I am a nerd about it. When I was in an Activator seminar in probably 1995, I heard that, eventually, the Activator device would both analyze AND adjust the spine. They were on the verge of a breakthrough, but this never occurred. Spurred by this possibility, and by the failure of Activator’s outcome, I looked extensively into what happened, and through fate, talked to someone who said that the promised device was the PulStar. Well, I was intrigued and excited to think that I found the missing link, so I went to Chicago to meet Dr. Joe Evans, PhD, and his son, Christian. I learned more than I have in a very long time at that weekend seminar. No, I didn’t buy my Pulstars that weekend, because I had to figure out how this would fit into my existing instrument adjusting practice. Christian gave me the name of some DCs that were certified AMCT doctors, and I talked to them. I asked them, “Did you get rid of your Activator Practice and replace it, or what did you do….” This was my personal quandary. Give up one for the other … what to do??? The DCs I talked to said they ADDED the Pulstar, and they did not eliminate one technique for the other. That was enough for me, so I made an order for 2 Standing Adjustable height PulStar systems, and Christian sent Dr John Smarch to Houston (at no charge mind you), to train me on these valuable instruments. It was a wonderful learning experience, and it came naturally. Since then, I have cataloged some very interesting anecdotal evidence about using these devices. For example, I noticed that if I had a wife in the clinic, the husband would never commit to care, as they didn’t see the need. After I used logic, and showed the printouts, the PulStar evidence, they were onboard. They stayed too! They referred too! I was amazed. This was an early-in-use finding. Later, I surmised that people don’t actually read anymore. They are very instant-gratification-oriented and are super visual. One of my practice coaches used to say, “Don’t TELL the patient that you can make a change, SHOW them, and then you will have patients forever.” This is my mantra at my clinic. So we also perform full spine AP and LAT standing x-rays, and we do re-exams showing the changes at 2 months to the C Spine Lateral, and at 4 months to the AP Full spine. Both techniques produce results like an Orthodontist, if you have the patient stick to a particular treatment plan. Instrument adjusting has made Chiropractors into practitioners who can make significant changes on Objective Outcome Assessments that are visual (i.e. 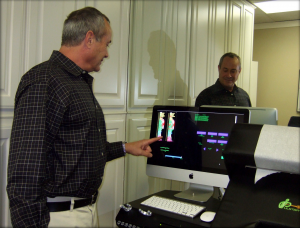 both x-rays, and PulStar analysis), and the patients literally are awed by the professionalism, the evidence, and the complete change in their perception of what a Chiropractor can do. And they TELL THEIR FRIENDS. Another insight, after utilizing both the Activator Methods and the PulStar System, is that although not every intervention in a Spinal Biomechanical problem responds 100% to a technique, it is important to a patient that if the treatment stalls (and from my experience, about 12-15% thereabouts DO hit a plateau, and don’t proceed), we have a change of venue. This will help the patient proceed in treatment, get further results, and save that patient from giving up, believing Chiropractic doesn’t work, and entering the Medical system, which maims them, and forever changes their lives. This is what I learned. If I got to a plateau in either method (e.g. Activator Methods, and switched that patient to the PulStar, or even vice versa), the patient proceeded, and we won the case outcome. They stayed on as maintenance patients thereafter. The patients also could not replace our clinic with the now archaic manual methods that were made obsolete by specific instrument adjusting. This is significant. How would every Chiropractor like to NOT LOSE 12-15% of their patients due to lack of results? I believe a lot of my practice problems were significantly solved by incorporating the PulStar. You will notice, I didn’t write a testimonial right off the bat, IT TOOK ME YEARS to compile this personal evidence. So this is totally unsolicited, and I’ve been meaning to get this on paper, and now it was the time. There is no denying the facts, and anyone who wants to talk to me personally is surely free to do so. Want to try the PulStar for yourself? Fill out the form below to schedule a no-obligation online screen-share demo today! Tell us when is best to reach you. Share some of your questions, what-ifs or concerns and we’ll customize our demo so it helps you most.